A boat doesn’t steer like a car. Its back end (stern) swings out when you turn the wheel. You should always be aware of what the stern is doing, especially on cruisers with restricted rear vision. A boat is also always under the influence of wind, and can drift in any direction. You must always be aware of how your boat is drifting, and make allowance for it – it will soon become second nature. Fenders ~ plastic air filled protectors that hang along the sides and stern of your boat to prevent damage when moored against quay-heads, banks and other boats. Make sure that the waterway is clear and the boat is in neutral gear before starting the engine. Depending on the wind, decide whether to cast off the bow or the stern first. With the engine running, cast off, taking care that the crew and ropes are safely aboard – a trailing rope can foul the propeller and immobilise the boat. 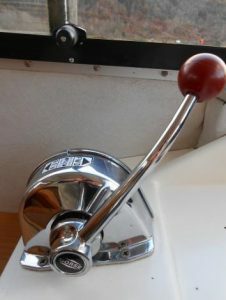 To start the boat moving, push the gear lever forward and open the throttle gradually. Watch the rear part of the boat as well as the front part, bearing the different steering principle in mind. A little assistance in pushing the boat off from the quay by someone on board is helpful. Proceed slowly until open water is reached. Even when a waterway is completely clear of other boats, it is best not to travel too fast. One half to three-quarters throttle is the most comfortable and economical cruising speed. You’ll get more mileage from fuel by not using full throttle. Reverse gear is your only brake. To slow or stop, throttle down, engage reverse gear and then gradually apply full engine power. As the boat comes to a standstill, throttle down again before putting the gear into neutral position. Don’t switch off until you have moored securely. When reversing (or going astern) a boats steering becomes less effective as there is no flow of water from the propeller onto the rudder. Because the rudder is not so effective, manoeuvring can be difficult. If you should run aground, first check whether your boat is holed and taking in water, and then seek the help of the boatyard immediately and give the exact details of your location. If your boat has not been holed, try to take it off in the same way you went aground. Once re-floated safely, check that the engine cooling system is circulating properly and that the water inlet has not become clogged during grounding. Also check that the water inlet is working correctly. If the propeller will not turn, do not force it. With the engine in neutral, the shaft may be checked for free rotation by hand. If you strike a rock and find that though still remaining afloat your cruiser is taking water, plug the hole with a blanket or whatever seems most suitable and make for the nearest harbour or refuge. If there is no refuge within easy reach, beach the cruiser in shallow water. Remember prevention is better than cure. Stop as soon as you safely can. Check if anybody has been hurt – if so help to look after them first. Inspect both boats and/or property and keep a record of the extent of the damage. Obtain the registration details of the other vessel and the names and addresses of its driver, its owner and, if possible, an independent witness. Do not admit liability and, as soon as possible contact your boatyard to report the accident. Insurance claims will only apply if West Highland Sailing has been informed. Complete the report form in found in the Handbook (whether people have been injured or your boat has been damaged or not). If this procedure has been followed, you will not be held responsible for damage if you paid the damage waiver (These principles will also apply to accidental damage to your craft or loss of equipment, unless negligence is proven against you). The most skilled yachtsman can only go where the wind allows and, when under sail, can only stop by steering the yacht head into the wind. You must therefore give him right of way. Always pass round the stern of a sailing yacht, never across its bow. Remember also that a gust of wind may make a sailing boat accelerate suddenly. When you wish to pass a yacht that is tacking across a marked channel, keep well over to the right, throttle right down, and wait until an opportunity arises to pass behind the yacht as it starts to tack over to the other side. Then pass astern of it. Remember – watch out for any signals given by the yachtsmen and comply with them. Always take your time – mooring is not a competition and if you rush you may lose control. Always keep your speed down and approach moorings slowly. Watch what the wind is doing. Always allocate your crew specific tasks and make sure that they understand their role. As you enter the mooring space, go into neutral and glide in. As you come alongside move the gear lever into reverse and give a few short bursts of the throttle to bring you to a standstill. Your nominated crew member can then step carefully ashore with the bow mooring rope. Do not jump ashore, as the quay may be slippery and uneven. Tie up the bow rope but not too tightly. Because you have come in against the wind the stern will drift gently in. Tie the stern rope firmly and then re-tighten the bow rope. Keep your engine running until you have safely moored up. Stop with the bow opposite the point at which you want to moor. Put the rudder hard over, and give the throttle a few bursts ahead to swing the stern in line with the mooring space. You can make corrections with one or two throttle bursts ahead and use of the wheel. Centre rudder and go slowly astern. As your stern approaches the quay, a quick throttle burst ahead will bring you to a standstill. Your nominated crew member can then step ashore and tie up both stern ropes. Sometimes it is easier to jump onto the next boat with a rope and pull your boat in, but don’t forget to ask permission from the other boat owner. 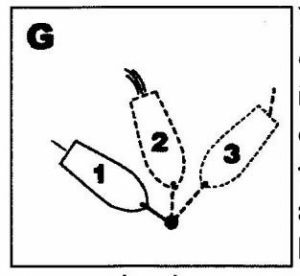 If there is a strong crosswind, make allowance for drifting (see Diagram C). Assess wind and plan on the basis of the following guidance notes. Ensure your crew know their responsibilities. Start the engine and while allowing it to warm up check that ropes are knot and tangle-free, easy to release (from onboard the boat if necessary) and not hanging over the side or stern. Adjust the boat’s position so that the stern rope is as near as possible at 90 degrees to the quay or bank and is easy to release. Cast off the bow rope first. Gently push the bow out as you step aboard (with the rope). Cast off the stern rope, engage forward gear and steer a shallow-angled course away from the mooring. Too steep an angle, or too much power may cause your stern to scrape along the quay or hit moored boats. Cast off the stern rope and stow away. Put the rudder hard over towards the bank or quay and go slow ahead on the throttle, gradually shortening the bow rope. As the stern swings out into the water, cast of the bow rope and go astern until well clear. Swing the rudder hard over and proceed. Remember these are not ‘hard and fast’ rules. There are possible variations depending on the strength of the stream and direction of the wind. The important thing is to assess the conditions and plan ahead. Do not pick up and secure to just any mooring you may find – they may be inadequate or dangerous. Use only recommended moorings – for details see page 18.